Being a member of Local 51 means you are helping yourself win better wages, benefits and a voice on the job. You are also protecting the security and future of your family. Local 51 provides its members with the training and opportunities that makes our membership the best in the business. Local 51 also helps make sure the States of Massachusetts and Rhode Island prioritize working people's issues-we hold corporations accountable, make workplaces safe, protect Social Security and retirement, fight for quality health care and make sure working people have time to spend with their families. Labor contractors want a job Done Once. Done Right. Local 51 helps make this possible, while keeping your large scale construction project on track and on budget through the use of Project Labor Agreements. 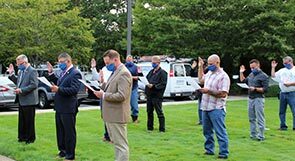 Increasingly becoming a popular management tool, a PLA is a collective bargaining option signed between construction users/general contractors and labor unions. The agreement spells out the terms and conditions of union employment for a specific construction project, such as this one at Amgen in West Greenwich, Rhode Island.